The starter on GM's 2.2L Ecotec engine is more difficult than most to remove, owing to a hard-to- access upper mounting bolt. This post applies to many small GM cars such as the Cavalier, Cobalt, HHR, Malibu, Alero, Grand Am, Sunfire, Saturn L series and Ion and some Opel and Vauxhall cars. I posted this tutorial with the hope of helping the home mechanic in performing this frustrating job. This post features a 2006 Chevy Cobalt. 1) Remove the large plastic engine cover to get a better view of the position of the upper bolt. Pull the cover free of the two ball headed posts, one at the extreme left of the cover and the other near the dipstick at the lower front. 2) Jack up the front of the car. I used a floor jack on the front tubular cross member, with a three foot long two by four to spread the weight of the car more evenly. Set it down on some jack stands or wood supports. 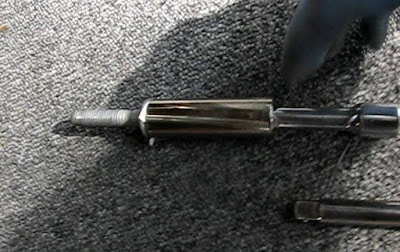 3) Disconnect the battery with a 10mm wrench or socket. It is in the trunk. 4) Unwire the starter. There are two connections to unwire. The small 8mm nut is the solenoid control signal and the larger 13mm uppermost is the battery plus connection. Remove these two nuts to unwire. GM left the starter studs unprotected from the elements. 5) Break the lower 15mm mounting bolt loose.This is the easy one. The upper bolt will more than make up for it though. 6) Break the upper 15mm mounting bolt loose and then remove. This is the toughie. Use a three or six inch extension bar and a deep well socket fed from underneath. 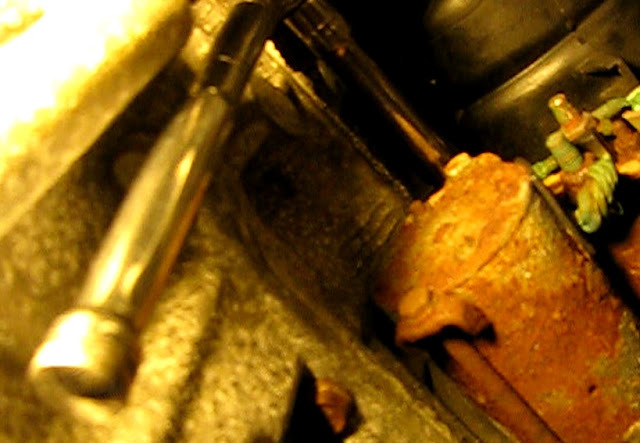 To find the bolt, have the socket and extension close to the engine and just probe until it seats on the bolt head. This may take a try or three. It may help to check the fit from above as the bolt head is just visable from up there in just the right light and angle. At last, we're on the bolt. 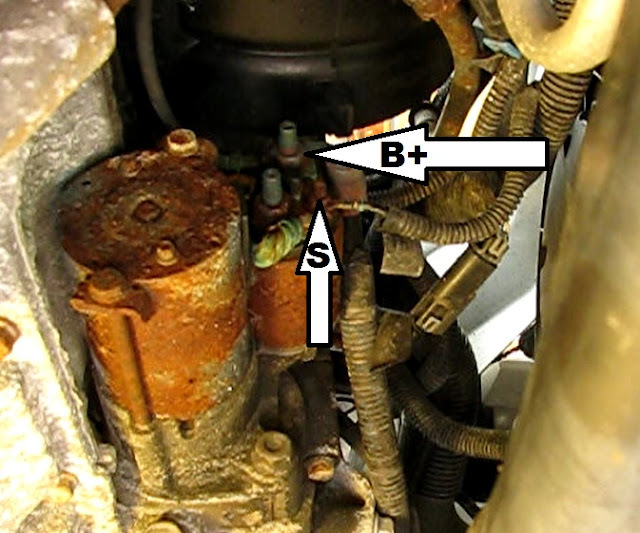 Note position of tools relative to starter and engine. 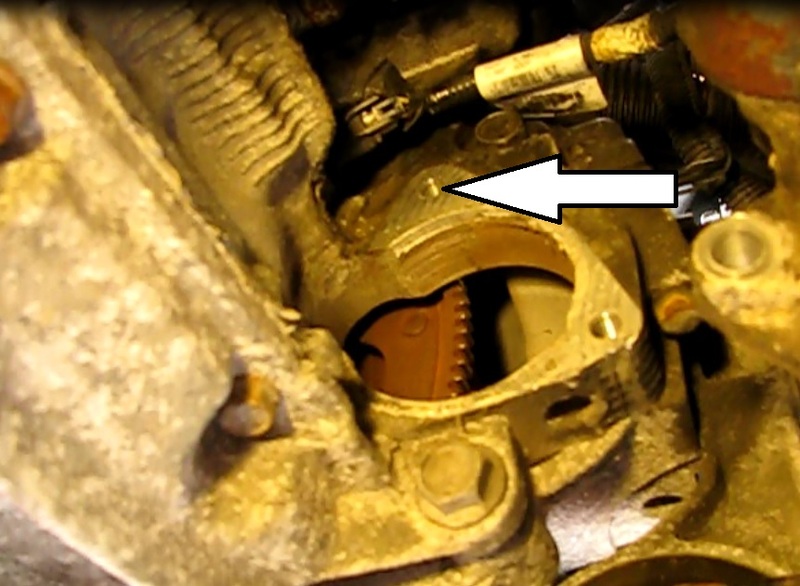 7) Completely remove the lower starter mounting bolt. 8) Remove the starter. Mine was corroded in place. I used a large screwdriver wedged between the right end of the solenoid and the transmission to force it apart from the transmission. 1) Affix the upper starter mounting bolt to the deep well socket. I used a piece of paperboard around the bolt head and then jammed the socket on it. This serves to hold the bolt to the socket so they don't fall apart during install. That would be very frustrating. Use a three inch extension with the deep well. Hold the bolt and tools in the upper mounting hole in the new starter as you place it in position. Start the upper bolt first if possible or at least hold it in place until the lower bolt is turned in to hold the starter up. 2) Tighten both bolts. Precision torque is not critical on a starter. 3) Rewire the electrical connections. 4) Remove the stands and lower the car. 5) Install the engine cover. Thanks for this article. I'm going to try to replace the starter in my wife's Cobalt tonight and I think this will help me out a lot. You're welcome and I hope the job went well! What's next to the starter?? If you are talking about the little cylinder thing, it's the solenoid. I removed every bolt and wire to the starter on 2006 Chevy colbalt. Ls 2.2 liter, and have gap but I can't get the starter out. PLEASE HELP!!!!! It's corroded in there good. I had the same problem. Get something in that gap like a big screwdriver or chisel and force it out. If the starter is bad anyway don't be afraid to beat it out of there. Good luck and thanks for using this blog post! Does this also go for a 2007 pontiac g5 2.2lr ecotech as well? I am trying to replace the oil pressure sending unit sensor on my wife's cobalt, which appears to be right on top of the starter. Can you confirm if you remember it being more accessible once the starter was out? If you look at the picture with the starter out, I believe the wiring for the sending unit is visible. Yes, removing the sending unit would be easier with the starter out. Maybe talk to someone at the parts store who sold you the starter. The wiring should be a direct fit and your is not. Are the 2 bolts definitely 15mm? I took a 15mm out from under but on the upper i removed a 18 mm but still the starter can't come off. I used a flat screw driver to force it out but, no luck. Thanks for the info on starters 05 Malibu,You were the only one I found that showed the ecotect starter.Very professional.Jumbo Ratcliff Baton Rouge La. Congratulations on the clear pictures of this post. I read several posts about changing the starter on my 2002 Saturn Vue with horror stories about accessing the top bolt. It was actually not that bad, but you have no visual and have to probe your way to the bolt with your fingers (a mirror might help, but i did not have one). I kept trying to put my 15 mm socket onto what I thought was the starter bolt realizing after about 15 min of trying that it might be bigger and indeed a 18 mm socket fit. Little did I know that it was the engine bolt, realized it once I had it out but that cleared the way for my fingers to locate the stqrter bolt, fit the socket and get the starter off. Only in this post (figure below item 8 ) do I see this engine bolt pictured. Good luck. Changed the starter on 07 cobalt now the trans isnt shifting any ideas? Thank you for this article. I'm a 53 year old widow lady who knows nothing about my car. But with no one to help me and very little money, I found this article. I had a time with that top bolt but finally I got it done. I appreciate you more than you could know!! With a good jack, you can carry out simple tasks like changing oil, replacing your filter and also changing your tires. When searching for the good quality jack, it is important to note that there are different types manufactured. Understanding how each type works will help you in narrowing down your decision and ensure that you have the best budget floor jack. Pittsburgh floor jack guide is the best jack. I currently replaced the starter in my 06 Malibu, charged the battery but my car wont hold a charge now. Was working fine b4 the starter was replaced. I was on a test driver after replacing and lost all power, power steering and dash light, all gauges stopped working but car was still on. Got home and it wouldnt turn over anymore. Unless I charge i hook it up to a charger. Any suggestions on what could be causing this? You may have lost your chassis ground. Make sure the battery ground is good and tight as well as the starter you installed. Check large black wires for tightness where they are bolted on. Great Job with pictures and step by step instructions. This helped me get the job done and your tricks worked great.